Does your pet have the potentially life-threatening condition Asthma? Asthma is essentially an allergic reaction from exposure to an environmental allergen. Feline Asthma is much more common, but dogs can suffer from asthma too. The most common clue is breathing difficulty from inflammation and mucus build-up that can block their airway. Seek veterinary help right away if you see signs of coughing and wheezing, loss of energy, and in severe case, if the gums are pale or blue. Common allergens that can cause asthma attacks are: smoke, household cleaners, air fresheners and perfumes, burning candles and other airborne pollutants. A little prevention can go a long way in helping your pet avoid attacks. Try to make your asthmatic pet’s living environment an allergen free zone. Avoid using toxic cleaners, strong perfumes and smoking near your pet and remove sources of airborne allergens such as dusty carpets, pollen producing plants, and mold. Feeding a hypoallergenic diet along with a using our Asthma Support Kit can greatly help. Asthma and Immune Support Kit- Trio of three liquid immune support formulas that provide gentle, natural support for pets with asthma. 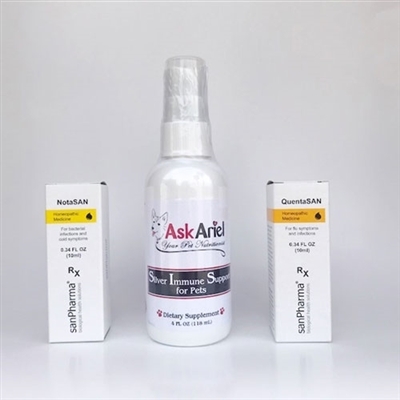 Can be used in combination with asthma medication. Clears up sinuses, nasal tract and improves breathing. NotaSAN- Anti-inflammatory, anti-infection formula. These homeopathic drops are especially helpful for relieving allergy symptoms. QuentaSAN to relieve nasal and sinus discharge, upper respiratory infections, coughing and infection. Works best when used along with NotaSan drops. Silver Immune-Broad spectrum antimicrobial that can be used along with antibiotics. Safe for young kittens with upper respiratory infections.